The NHS-owned company says it 'can operate more competitively against private companies'. Workers appear to be paying the price. Unison have accused a controversial NHS-owned body of dodging national pay rates, as workers in Bolton take part in two days of strike action from today. 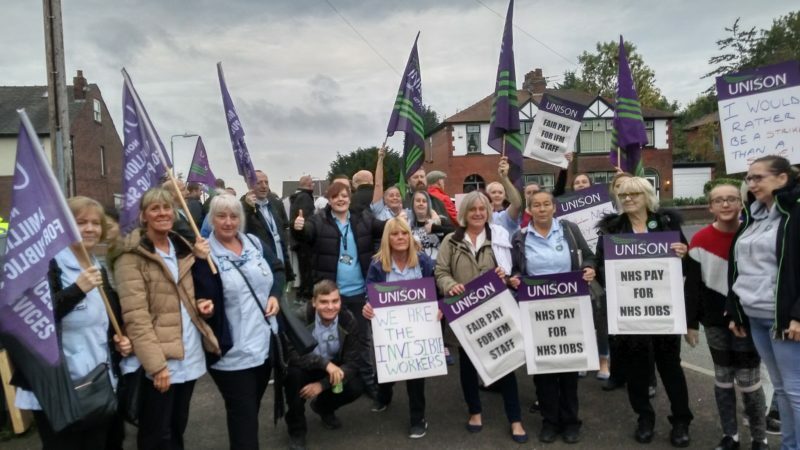 Cleaners, catering staff, porters and security staff are among NHS workers preparing on strike for ‘fair pay’ on Thursday and Friday, following the refusal of Bolton health bosses to pay hospital staff nationally agreed pay rates for NHS staff. Trade unions have been warning for some time that the creation of ‘sub-cos’ – NHS-owned, arms-length companies – could pave the way for NHS organisations to gradually undermine pay and conditions. Now it looks like this is happening in practice. Staff transferred from the NHS to these companies have their current pay and conditions maintained – but they are not automatically entitled to NHS-wide pay rises. The sub-companies do not have to pay VAT, a major driver behind some Trusts’ decision to set up these arms-length organisations. Unison say iFM Bolton – owned by Bolton NHS Trust – signed an agreement to keep up with NHS rates of pay last year, when the company was set up. But the union claims iFM Bolton are not keeping their promises. iFM Bolton management recently offered to pay staff the real living wage rate – which is calculated by the Living Wage Foundation and is currently set at £8.75 per hour. However, this is less than the lowest NHS pay rate, which is now £8.93 per hour. The gap between the (lower) Living Wage and NHS minimum rates is anticipated to grow in future years, reaching £1,500 a year in 2020/21 for these low-paid staff. Unison have given iFM Bolton notice that a further three days of strike action will take place on 23-25 October if this issue is not resolved. iFM Bolton was set up last year as a subsidiary of Bolton NHS Foundation Trust, but makes its own decisions regarding finances and terms and conditions. Nearly 300 NHS staff were transferred from being directly employed by the NHS, and another 300 from private contractor ISS Facilities Services. The majority of the latter are on iFM terms and conditions, not NHS, and are therefore not eligible for the NHS national pay rise. That ‘competition’ appears to involve dodging national NHS pay rises. “This is a very simple matter of fairness. Bolton’s hospital workers deserve to be paid the NHS rate for the important jobs that they do. Why should they receive less than people doing the same jobs in neighbouring hospitals? A spokesperson for Unison told Left Foot Forward the dispute compares to Wigan NHS workers, who recently went on strike to fight plans to outsource them to an NHS-owned sub-company.